Disclaimer: Black Lapel sent The Peak Lapel this coat at a steep discount for the purposes of this review. In recent years there has been a true explosion of made-to-measure menswear online. Specifically, it’s usually custom suits and shirts. Only a few, select companies offer custom outerwear, like topcoats, peacoat, and more. Black Lapel is one of those companies, and they bring the same customized details and fit to outerwear as they do to their suits and shirts. Hopefully, one day soon we’ll do a review of their suiting and shirting options, but this review is all about their outerwear, specifically their topcoats. Finding great quality outerwear that fits, and that has all the details you want, is super challenging. Especially if you don’t want to spend thousands of dollars on a coat. The custom outerwear offerings at Black Lapel are actually super unique — almost no other company offers custom outerwear, and certainly not in the $500-$1,000 price range — and so I was super excited to give it a try. Given how rare and unique offering custom outerwear is in the first place, Black Lapel offers a solid amount of options. All the classic styles are there: black, grey, and navy in single or double-breasted, as well as one or two more edgy fabrics and blends. Will you be able to get something like all the extensive options offered at SuitSupply? No, not even close. But, that is kind of the nature of the beast here. Until Black Lapel has time to really build out their options, their starting collection of custom outerwear options is definitely solid. If you’re looking for a wardrobe staple, to be the bedrock of your formal outerwear collection, Black Lapel has got you covered (pun intended?). We went with a single breasted charcoal herringbone topcoat, with peaked lapels and a ticket pocket. I also went with a single breasted style as, in my mind, it’s a bit less loud and more classic. Black Lapel also offers a 2-3 button roll which means that, like a few of my suit jackets from SuitSupply, there is a “hidden” third button that you can choose to button if you want a higher button stance, and will simply roll and disappear when not buttoned. This is a wonderful, higher end luxury feature that really sets this coat apart. I love it. Overall, goddamn, is this thing a looker. I absolutely love the peaked lapels on a topcoat, but they are pretty hard to find. Same thing with a ticket pocket. When you’re making a custom coat though, it’s no problem. A click or two of the mouse, and you have precisely the styled coat you want. And we didn’t even go too crazy with the customization. You can change the pockets to slanted or straight, add contrasting colored lining or button stitching, a waist belt to eh back of the coat, and more. I wanted to keep things pretty classic for this topcoat, though, and I certainly thing I did that. This thing is just striking in every way. It is a beautiful coat that goes with literally any color or style suit. The fabric is rich and textured, is neither too light nor too dark, and the peak lapel looks fantastic and is perfectly proportioned. In all, it is exactly the topcoat I have always wanted, but never found available for purchase off the rack. I think that Black Lapel falls squarely in the middle of made-to-measure websites. It’s not bad by any means, but it’s nothing special either. It’s very simple to navigate and use, it’s super easy to log in and see all your measurements, as well as upload pictures of yourself for fitting purposes, but, at the same time, there is no live-updating reflection of any details of customization options you select. There is only one or two pictures of a pre-designed coat in the fabric of your choice, and it remains static even as you change your options. No, a live-updating rendering of your garment is not necessary, but it certainly is nice and adds a sense of confidence to your order. Maybe Black Lapel will add this in the future. Now, as is typical with online made-to-measure, the first fit was a bit off. It was pretty close, and a great start, but, as you can see above, a few things needed to be refined. The hips were a bit too loose, the sleeves were a bit too long, and the upper arm had too much room. Black Lapel is happy to offer you a credit to have these sorts of changes made at a local tailor, which is what I did. (If the coat is, for whatever reason, so off that it cannot be easily fixed via tailoring, Black Lapel will make you a new one.) Whatever changes you made you can tell Black Lapel, and they will update your fit profile so future orders will come in fitting perfectly. 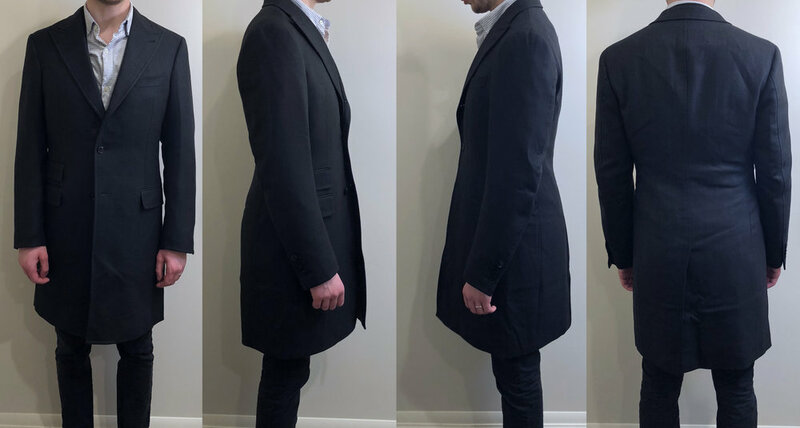 This whole process is very standard for online made-to-measure (not quite as good/“bespoke” as Articles of Style), and Black Lapel’s customer service was, in my experience, outstanding. In sum, Black Lapel’s overall process is pretty straightforward and painless, and the overall shopping experience was quite positive. After my coat came back from the tailor, the final fit is truly just about as perfect as you can ask for. The waist, chest, and hips all fit perfectly now. The sleeves look slim, but are not at all constricting. The length of the coat and the sleeves is spot on. The shoulders hit perfectly on my body, the coat looks and fits great buttoned or unbuttoned, and, aside from a slight divot that sometime forms at the edges of the upper back, this coat is about as close to perfectly fitting as is possible. It’s one of the best-fitting garments I own, and I get excited every time before I put it on. Now, as with any good topcoat, the fit should be slightly roomier than an actual suit jacket, since topcoats are, well, supposed to be worn on top of suit jackets. Thus, they need to be able to slip on and off easily and comfortably, and not restrict movement when worn. This topcoat does that perfectly, while balancing the slim, clean aesthetic I always go for with my clothes. This being the case, it does not look quite as good when there is no jacket being worn underneath, though if that is the look you are going for, and don’t plan to wear it over a suit jacket, you can always ask that it be tailored a little bit slimmer. Just be aware that you cannot really do both. It can either be cut to be worn over a suit, as is traditional, or it can be cut slimmer for the modern streetwear look of wearing an overcoat and, say, black jeans. But it’s one or the other, and I went with the more traditional fit as I wear suits at least two or three times a week, and was looking for a formal topcoat. Finally, I will say that, depending on the suit jacket I am wearing, the back of the collar/lapel of my suit jacket sometimes gets caught on the topcoat’s collar as I pull it on, and ends up not sitting/laying quite right. This doesn’t always happen, and a bit of adjusting of the coat, and tugging of my suit jacket usually fixes it, but I thought I would point it out nonetheless. It’s neither the topcoat’s nor the suit jacket’s fault. It just sometimes happens that suit jackets — depending on fabric type and size of lapels/collar height — get a bit rumpled and don’t sit nicely under a topcoat that is cut to fit a bit slimmer, and closer to your body like this custom one. This topcoat is very well made. It’s not exceptional, but it is amongst the nicer coats I have worn. It drapes nicely, the fabric is rich and has a nice weight to it. All the stitching is clean and neat, the buttons are solid and quality, and the front buttons are reinforced with mini-interior-buttons. I would say it is overall perhaps a step above what you would get from Banana Republic or J Crew. It has a slight edge in quality over both, especially when it comes to things like the 2-3 roll front which requires certain canvasing in the jacket that Banana Republic surely does not have. Perhaps it’s a tiny step below SuitSupply in terms of quality. That being said, Black Lapel does offer higher end coats at the $1,000 price point that likely feel even better and nicer than this one. What about the warmth? I think it’s also pretty standard. I actually went with the quilted lining for a few bucks more, which definitely adds some heft and warmth to the coat, but this is still not designed to brave the dead of winter. If you’re like me, and usually find yourself pretty hot, then a sweater, suit jacket, and this topcoat (along with gloves, a scarf, and ear-warmers) will probably be enough even on a pretty cold day. If it’s really freezing out though, or it’s snowing, you’ll want to go with something more designed for extreme weather. Basically, I think this is a fantastic coat for about 40 degrees and up. Between 30-40 it would depend on personal preference. Below that, I would go with a winter coat. It stacks up in this regard quite similarly to any topcoat I have ever owned, and, with the quilted lining, is maybe even a bit heavier/warmer. Great for cool to cold. Not meant for freezing. But this, again, is pretty standard. This topcoat will run you $599. But, it’s sold out right now and I was told it will not be coming back. Nevertheless, next season Black Lapel is sure to offer a whole bunch of new options for their custom outerwear line. At this price, the ability to get a well made coat, with all the details exactly as you want, that is made of nice fabric, and fits your body specifically is a pretty fantastic deal. Typical topcoats don’t cost much less than this off the rack, and for all the benefits of made-to-measure, I’d rather pay a bit more for slightly better quality, plus all the other up-sides to the custom route. In conclusion, The Peak Lapel wholeheartedly recommends Black Lapel outerwear.